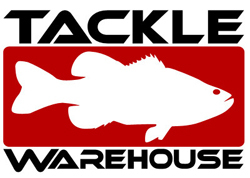 Like many of you information crazy anglers out there, I am always on the lookout for information regarding new product. Hopefully, this quick un-boxing can help you as an angler make an informed decision regarding potential purchase of this reel. Please note the intent of this writing is not to pass definitive judgement or draw final on the water performance conclusions. 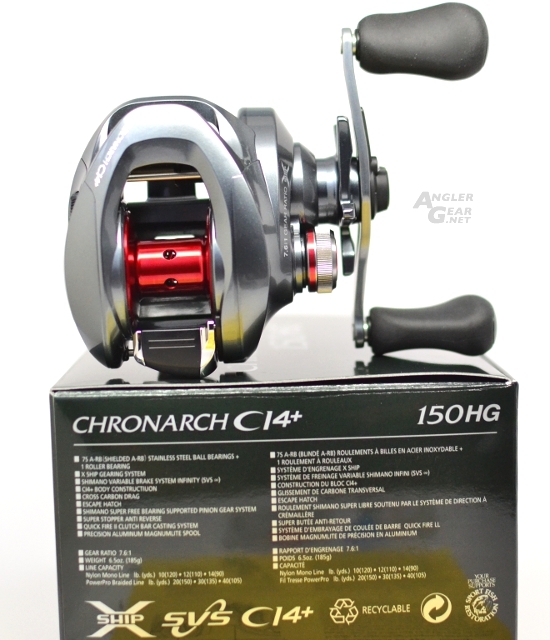 This is Shimano’s newest bait cast reel to the US market the Chronarch CI4+, which took home 2013 ICAST “Best of Show” award in the Freshwater Reel category. 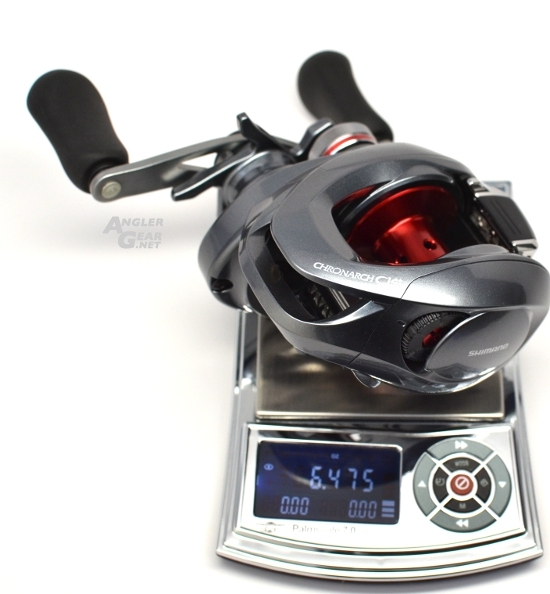 This reel utilizes an all new frame and body design for the US market. This particular model is the 150HG right hand retrieve 7.6:1 gear ratio rated at 32 IPT (Inches Per Turn) and carries a retail price of $269.99. Let’s open her up. 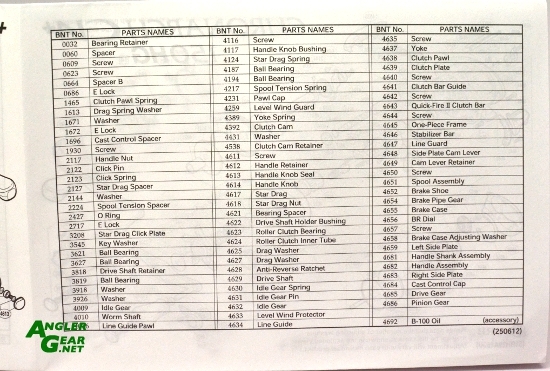 Inside the box we have the reel, schematics, instruction manual, additional brake shoes, and oil. 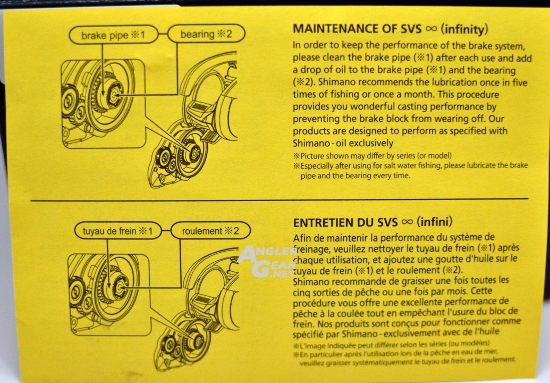 New maintenance procedure specifically for the SVS Infinity Braking System: Much like any precision mechanical device, Shimano recommends proper lubrication of the brake contact surfaces at regular intervals to decrease wear on the brake blocks. 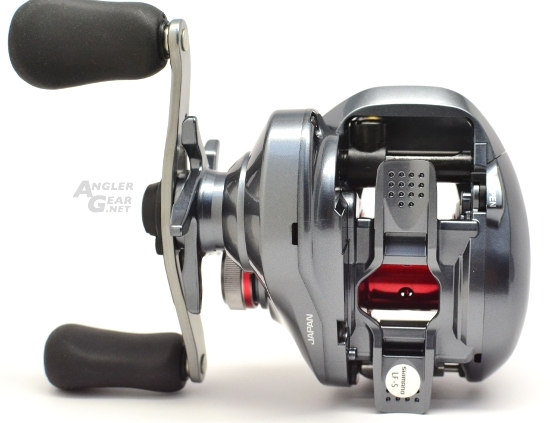 This reel features an 8 bearing system in total 7 S-ARB (Shielded Anti Rust Bearings) + 1 ARB Roller Bearing. Shimano’s ARB bearings go through a proprietary process that is designed to make them more corrosion resistant than an off the shelf stainless steel bearing. Astute observers will notice the omission of Shimano’s assist stopper feature (most likely to save weight) from the above schematics. 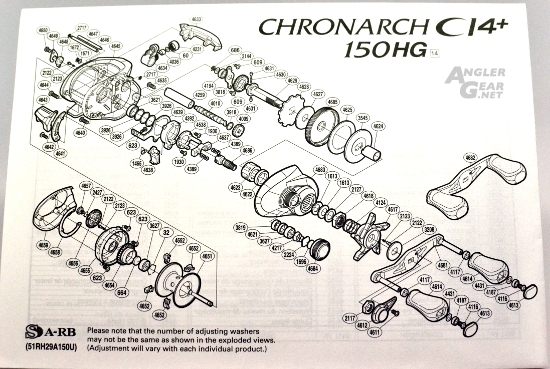 This feature is present on reel platforms such as the Chronarch/Curado 200E, but not others such as the Core. 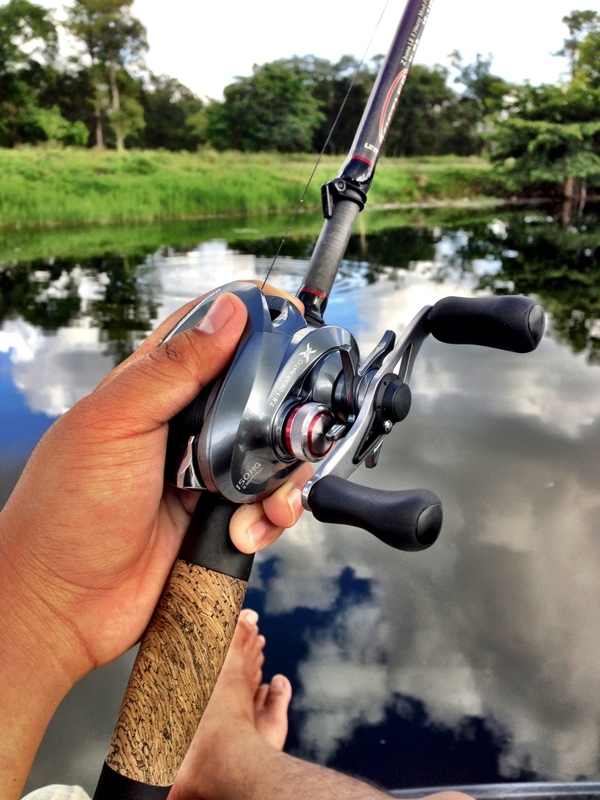 This reel is an introduction of the CI4+ material into a low profile bait cast reel. 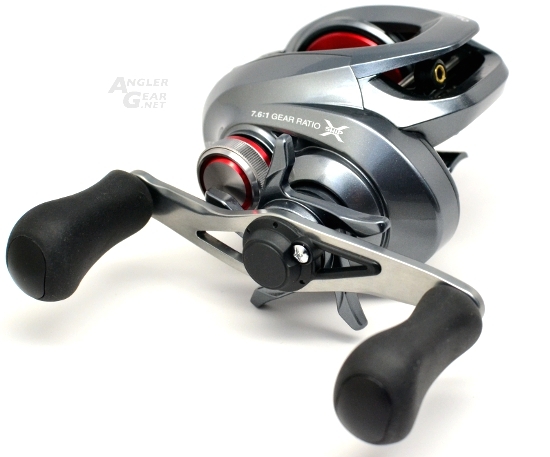 Essentially, advertised as a more ridged composite than their original CI4 (and XT-7 graphite material) used on some of their other reels such as the 2009 Stradic CI4. The frame and both side plates are all advertised as being constructed with this material. 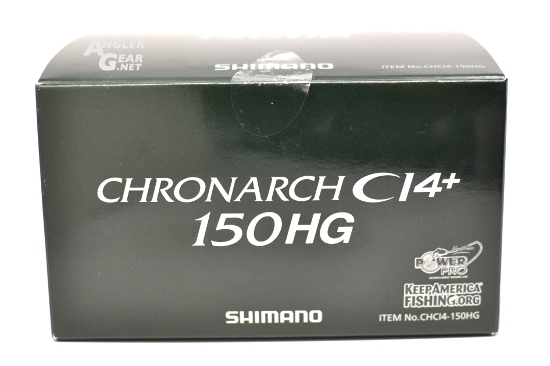 Shimano’s CI4+ can be viewed as analogous to Daiwa’s Zaion composite material. Individual advertising claims aside the predominant advantages of going with such a material are essentially going to be weight reduction over a standard aluminum chassis reel. As well as, the ability to be structurally comparable to a magnesium framed reel while also bringing in the ability to be corrosion proof (i.e. 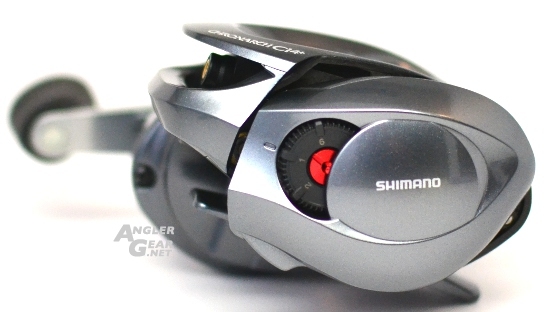 this reel is officially approved for use in saltwater or brackish water environments by Shimano). Out of the box fit and finish on this reel was excellent. The the handle is swept in slightly and has Septon knobs. 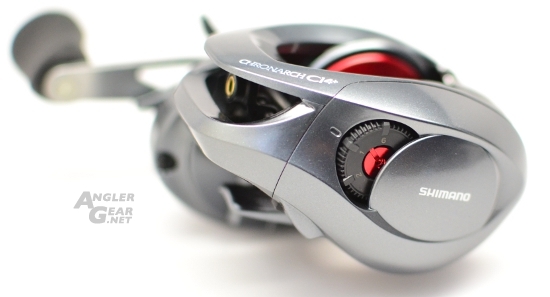 The drag star is plastic and the cast control does not feature an audible click. 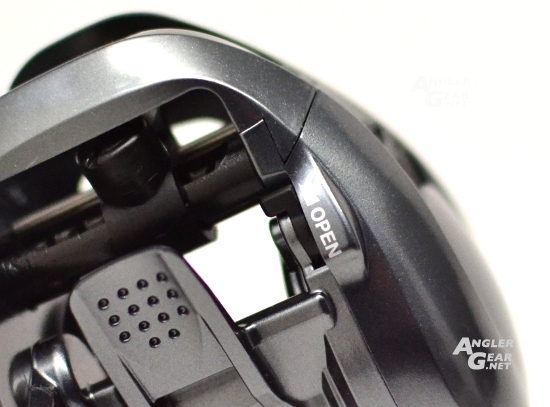 The famous Shimano “handle back play” is slightly present. Handle Length is ~85mm from center post to center post. 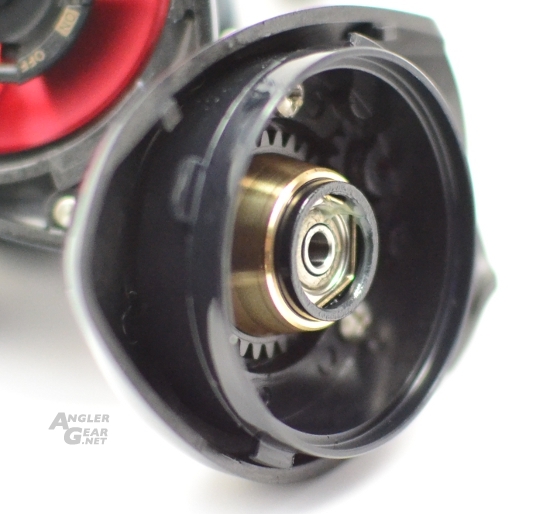 Essentially all of Shimano’s modern low profile bait cast reels utilize a bearing supported pinion gear they call “Super Free”. This feature has been around for well over a decade. 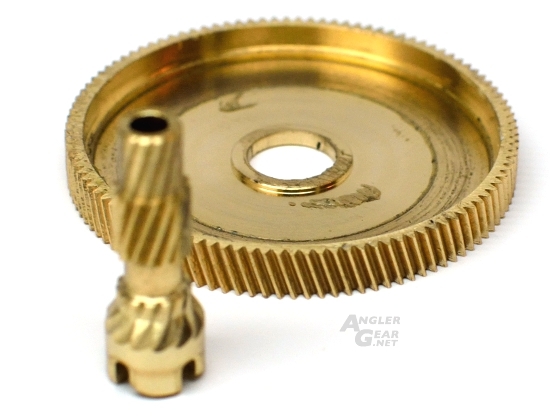 What this bearing does is keep the pinion gear in alignment with the spool shaft after the clutch is disengaged and keeps the pinion gear out of contact with the shaft. 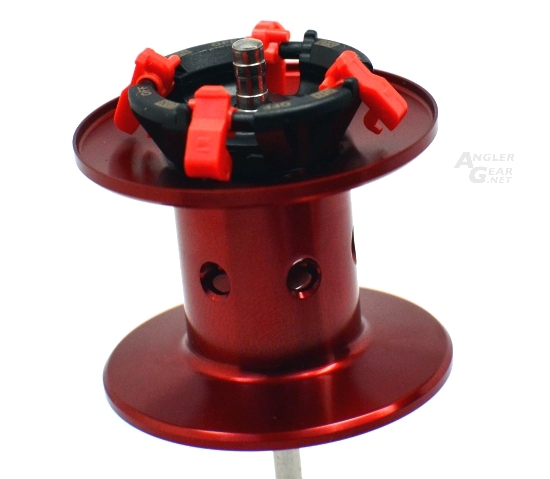 This basically allows for longer free spool times and longer casts. Now in addition to this single bearing Shimano adds an additional support bearing and optimizes placement of both gears. Thus, both ends of the pinion gear are bearing supported and this feature is called “X-Ship”. The purpose of this feature is to keep the gear train in line and mitigate energy loses due to friction caused by deflection when the gear train is under load. 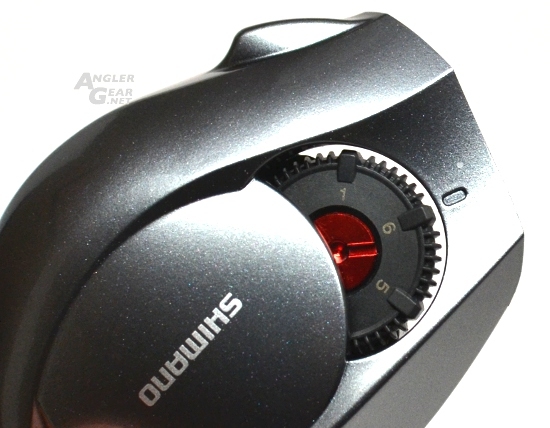 What this should effectively translate to the angler is increased mechanical efficiency which we as anglers observe as “Cranking Power”. More specifically, “Cranking Power” while under load like when you have a big fish one the end of the line. Flipping the reel over you can see that this reel is manufactured in Japan. 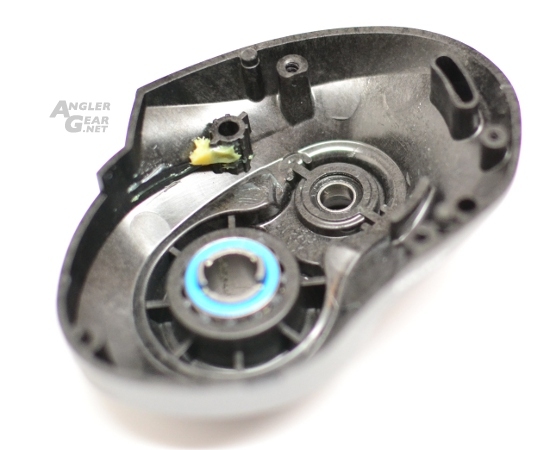 Which is printed on the handle side plate instead of the embossed implementation you typically see on the underside of the reel foot on other Shimano baitcast reels (here that specific area has been ported out). The palm side plate shows the dial for adjustment of the SVS Infinity system. I counted 38 clicks from starting position. The spool of the reel can be accessed by rotation of this switch on the underside of the palm plate toward the front end of the reel. The side plate can then be rotated downward (Counter Clock Wise when looking at the reel side plate directly) and subsequently fully detached from the frame. 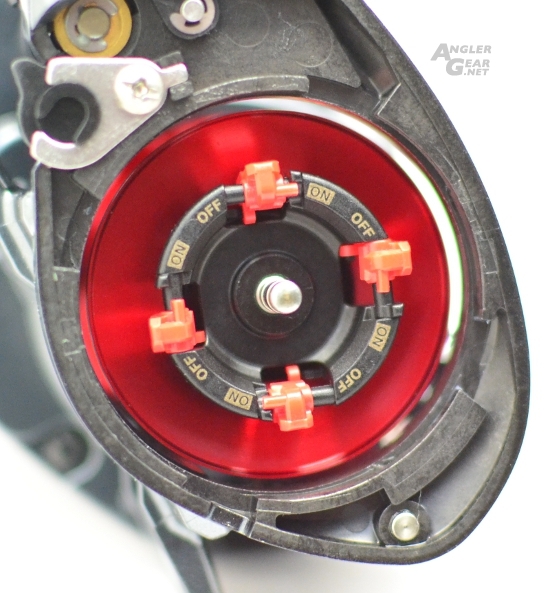 With the side plate fully removed you can see that the brake system has 4 brake shoes (note: there are 6 on the JDM 2013 Metanium) that you can toggle between the on an off position by sliding sideways. This differs from the operating condition for Shimano’s traditional VBS braking system. As the spool accelerates during a cast the outer portions of the brake shoes rotate outward causing the entire brake shoe to rotate and come into contact with the tapered ring on the interior of the side plate. The traditional VBS system has brakes which move to come into contact with a ring outbound from the central axis of rotation. Each system will have its own inherent advantages and disadvantages. As simplistic and reliable as the VBS system is, the new SVS infinity offering greater range of adjustment, as well as, the ability to externally adjust braking parameters on the fly. The above photo is a good example of how the brake shoes swing outward. When toggled in the “on” position the shoe itself rotates about its small holding bar. When in the “off’ position small hooks at the bottom of each brake shoe are locked into holding features on the brake hub. Lots of grease was on the side plate bearing for this particular reel. Coloring of this reel is a shade lighter than what you’d find on a Core. Also notable is that clicking over the handle there’s a district change of feel due to the full implementation of CI4+ material for both the frame and side plates. Not necessarily a good or a bad thing just different. Compared to say the magnesium frame on this core 50mg7 or this aluminum framed Curado 200E you certainly do not get the same in hand metallic feel. One small item i noticed is that HEG is not explicitly stated on the box nor is Shimano’s Micro-module gearing. HEG is found in a majority of their modern bait cast reels. Essentially, this is Shimano’s design approach to eliminate flex and increase leverage in the gear train. They accomplish this by increasing the size of the drive gear and pinion while using a structurally rigid one piece frame and stamped handle side plate. Micro Module gearing is found on the latest JDM Antares and JDM 2013 Metanium and is essentially a reduction of teeth size on both the main gear and the pinion gear. This is done to increase the number of gear teeth in contact with each other while mitigating roughness during retrieve. 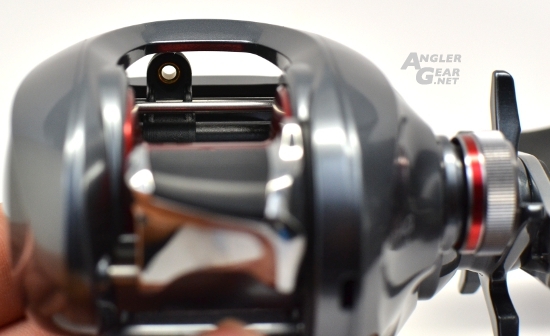 The cut of the gearset present in the 150HG does not represent this feature. 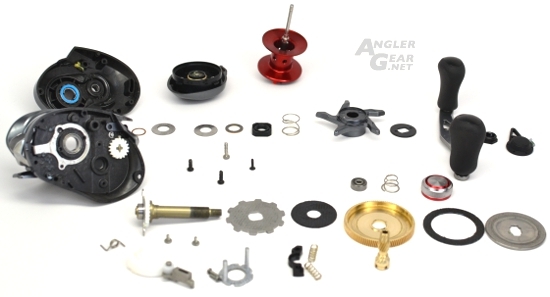 In either case, it is most likely the marketing intent that the gear set for this reel falls into the blanket term “X-Ship” for use in baitcast reels. At the time of this writing, all of Shimano’s “X-Ship” detailed definitions I could find strictly appertained to their spinning reels. I will seek to clarify this at a later date. Time to spool up and get this bad boy out on the water. I hope this post has helped some of you out. 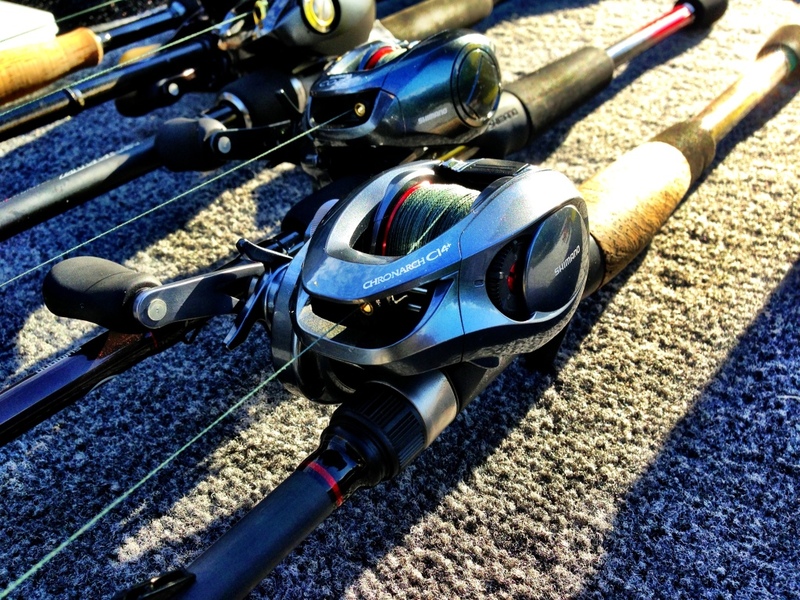 Looking to try one of these new reels? 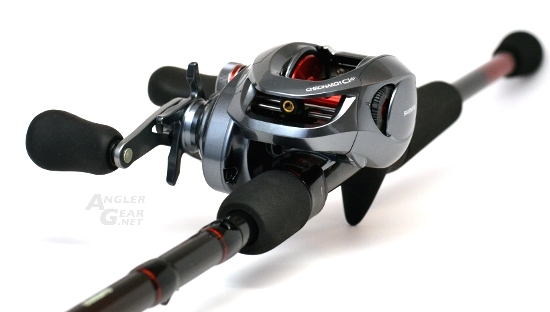 Possible Redesign for the Shimano Chronarch B and 50MG?